We live in interesting times -- a phrase made popular in modern times when in 1966 Robert F. Kennedy said: "There is a Chinese curse which says ‘May he live in interesting times.' Like it or not, we live in interesting times. They are times of danger and uncertainty; but they are also more open to the creative energy of men than any other time in history." Well, that description certainly fits the adoption of cloud computing and its effect on many technologies, perhaps none more than database management systems. Databases have always been tremendous consumers of as much computing power as could be made available - whether in memory, storage, I/O - for both maintaining information, as well as the queries against that data. When cloud computing came along, it was attractive for its seemingly limitless resources available to databases. But, it was initially also scary to trust those off-premises computing resources to hold our most important information. We've come a long way in a short period of time. 1- We've come so far that the long-standing database king, Oracle, is losing ground. In April, AWS reported that tens of thousands of customers were using Amazon Aurora for their relational databases -- a number that increased by approximately two-and-a-half times over the past year. AWS said its Aurora service, which is MySQL and PostgreSQL compatible, is the fastest-growing service in the history of AWS. Just recently, Wikibon analyst James Kobielus wrote, "Over the past several years, AWS and its cloud data services - such as Redshift, Aurora and DynamoDB - have become as dominant in the public cloud area as Oracle Database ever was in the enterprise data center." This leads to my safe bet that in 2019 enterprises will further accelerate their move away from Oracle databases in favor of cloud options, especially open source-based DBMSs. 2- While we're on the topic of cloud computing, I predict that Alibaba passes Google as the #3 cloud provider (not really) behind AWS and Azure. Actually, that doesn't happen in 2019 but Alibaba will make ground on Google moving closer to #3. This is of course largely due to rapid growth in the China market, but they are making headway beyond their home market as well. 3- My next prediction is that 2019 will be the year that container deployment of DBMS software really starts to take off. While most container/Kubernetes deployments to date have largely been limited to stateless applications, 2019 will see a big uptick in deploying databases in containers. While there are certainly some databases being deployed in containers today, the maturation of stateful-sets, container-ready storage and other supporting components are making it easier and more reliable, which could lead to a tipping point in adoption in 2019. 4- I believe that, despite all the hype we're hearing around machine learning, the luster comes off in the year ahead. Look how IBM moved off of Watson to make a huge investment in acquiring Red Hat. There are definitely some solid efforts, like TensorFlow, that show lots of promise but I remember query optimization research that dates back to the early 1970s with roots in machine learning. Maybe it's just my perception since I dropped out of MIT in the 80's to join an AI startup, but It feels to me like this has been around forever. 5- MongoDB announces another big innovation that relational data management systems have had for 20 years. In 2018, MongoDB announced with much fanfare its introduction of multi-document ACID transactions, a capability that relational database management systems like Postgres have had for decades. Unfortunately, even this new feature came with a great many caveats. In 2018, I predict there will be another bold press release from Mongo about a feature that has been in every RDBMS for years; maybe even a standard query language? 6- Finally, I predict that this is the year that VMware finally finds its way to achieve its cloud aspirations, and it's by becoming the AWS region in your own data center. VMware has had a number of false starts in the cloud from vCloud Air to VMware Integrated OpenStack to running VMware on public clouds. I think the recent announcement the company made along with AWS introducing RDS (Relational Database Service) running on VMware for workloads that need to remain on-premises for compliance with security, privacy, regulatory, or data sovereignty policies will change that. The year-ahead will see AWS pay more attention to on-premises and VMware is now in a great position to benefit from that shift by allowing you to run those AWS services in your own vCenter environments on-premises. So there you have it, with cloud computing taking hold Oracle loses ground, Alibaba gains ground while AWS comes from the cloud to the ground (on-premises) using VMware's technology as its beachhead. To paraphrase Bobby Kennedy, these times are open to the creative energy of men and women - perhaps more than in any other time in history. 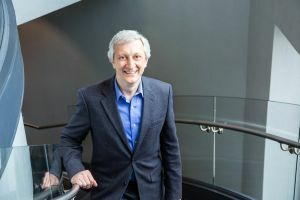 Ken Rugg is EnterpriseDB's Chief Product and Strategy Officer and is charged with leading the company's product and strategic vision. Prior to joining EDB, Ken was the founder and CEO of Tesora. The Tesora DBaaS Platform, based on OpenStack Trove, let enterprises provide self-service database provisioning and full lifecycle management to their developers across 16 different databases, including Postgres, MySQL, Oracle, MongoDB, Cassandra and others.